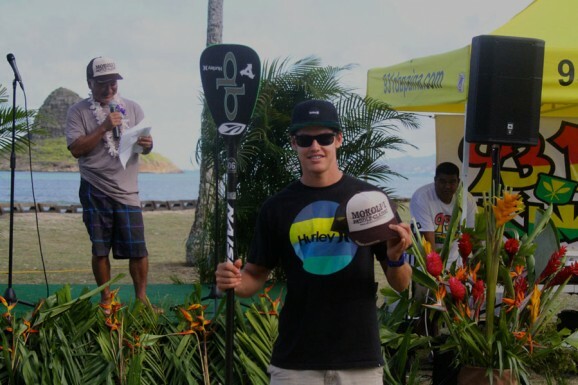 The first ever Mokoli’i Paddle Classic was held last weekend. Over 50 Stand Up Paddlers (plus another 20 or 30 prone and OC1 paddlers) took part in the inaugural event, which was held at Kualoa on Oahu. One of Naish’s stars (starting to lose track of how many young guns are on the Naish team…) Noa Ginella took out the win, finishing the 3 miles (into a slight headwind) in a time of 26 minutes 10 seconds. Paddling legend Aaron Napoleon won the stock 12’6″ class (and was third overall) while his son Riggs was right behind him. Meanwhile Kim Celebre was the fastest of the women, coming home in 34 minutes 46 seconds. Click Class or Division to sort results by Board Class, Age Division and Gender.